Acer’s Predator 15 is kind of like the Facebook friend whose status we check once in a while, noticing a new component or some small change since last time. This latest generation sports a new GPU in the form of the recently released, thin-and-light gaming laptop darling, Nvidia's GTX 1060. The catch is, this Predator is no thin-and-light, sporting a nearly identical design compared to the previous generation. It’s a bit odd, as the entire premise of the GTX 1060 is that it runs cool enough to allow smokin’ gaming performance in a relatively thin chassis, especially compared to the previous generation of Maxwell-outfitted laptops. MSI designed its Stealth laptop with the same CPU and GPU that weighs just four pounds. There are advantages to having a big case: a higher-capacity battery, a more spacious keyboard; larger, quieter fans, and plenty of room for components. But the fact that Acer didn't remove any weight compared to the predecessor is a real head-scratcher. The lid on the Acer Predator 15 has just enough of a touch to let you know it's a "gaming" laptop but doesn't go overboard with the bling. 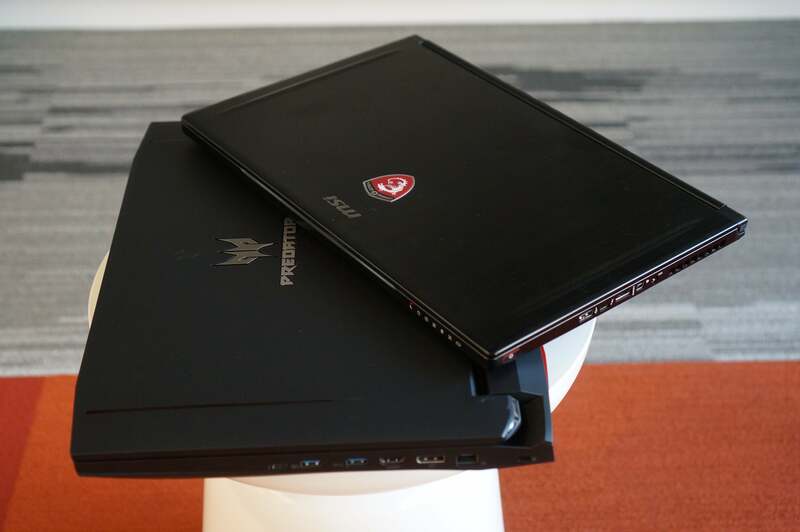 The Acer Predator comes in two sizes—15 inch and 17 inch—that are otherwise nearly identical. For this review we’ll be focusing on the 15-inch model, whose sleek, rubberized plastic shell looks cool and does a fantastic job of repelling fingerprints. It's huge: 15 inches wide and 12 inches deep, and just a smidge over 8 pounds, not including its sizable power brick. The 17-inch model is 1.1 pounds heavier. 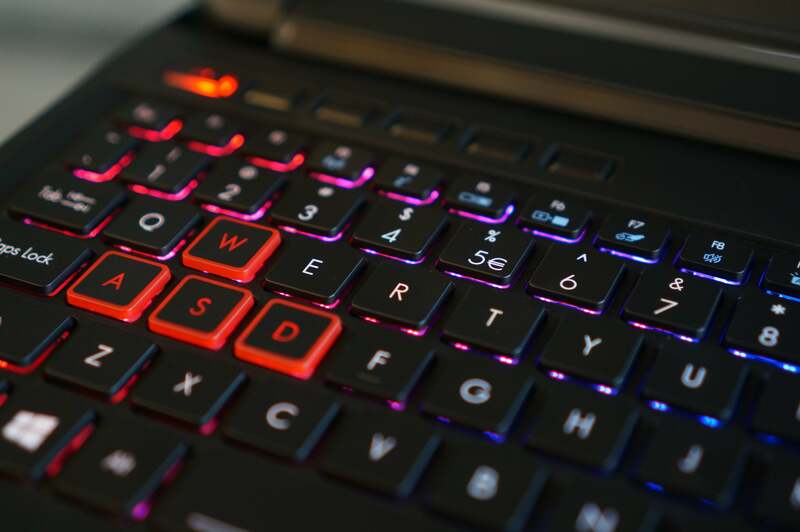 The Predator has room to spare for a full-sized keyboard, with several gaming-centric features such as an LED strip around the trackpad, red keys for WASD and directional arrows, and of course, customizable RGB backlighting. You also get 15 hotkeys. The island-style keys are very easy to type with, and that’s coming from a mechanical keyboard fan. 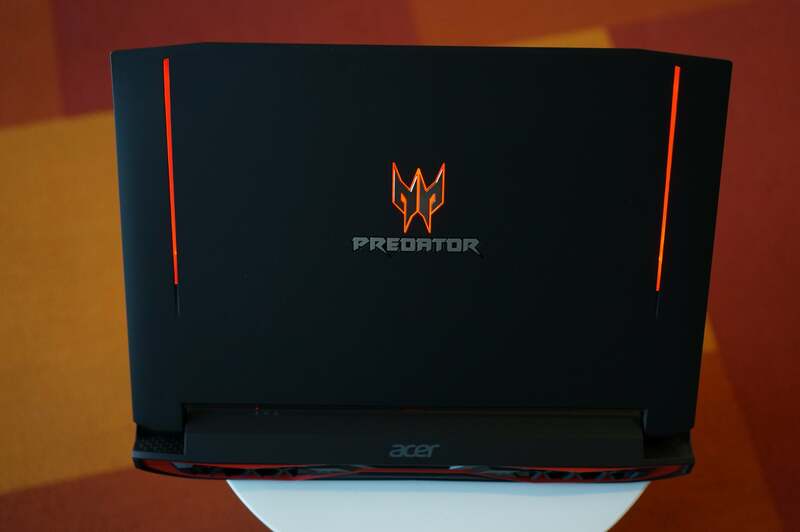 The large body of the Acer Predator 15 means there's plenty of room for ports on the side. 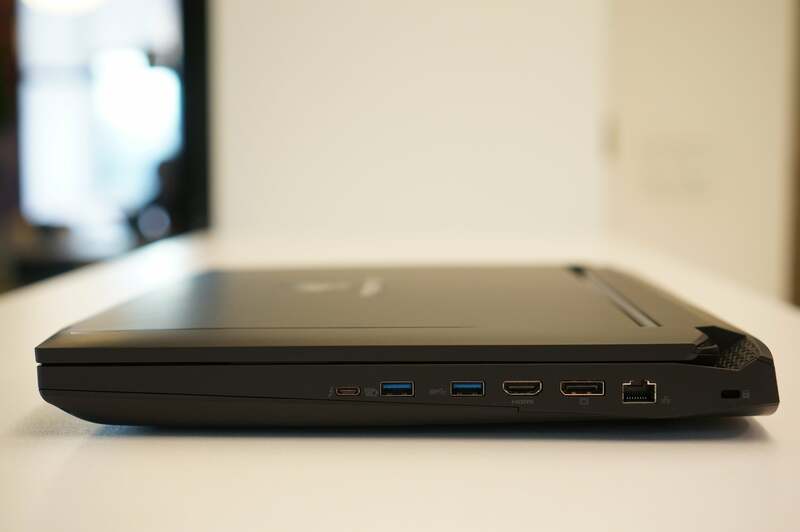 The right-side ports include a Thunderbolt 3/USB-C connector, two USB 3.0 Type A, full-size HDMI, full-size DisplayPort, and Gigabit ethernet, along with a Kensington lock slot. The left side boasts two more USB 3.0 Type A ports, headphone and microphone jacks, an SD card reader, and a removable optical drive. You can swap out the optical drive for an additional fan named Predator FrostCore—the drive releases easily by pushing a switch on the laptop's underbelly—but the additional fan’s not necessary. Rounding out the features is a 2.1 speaker system Acer calls SoundPound 2.1. 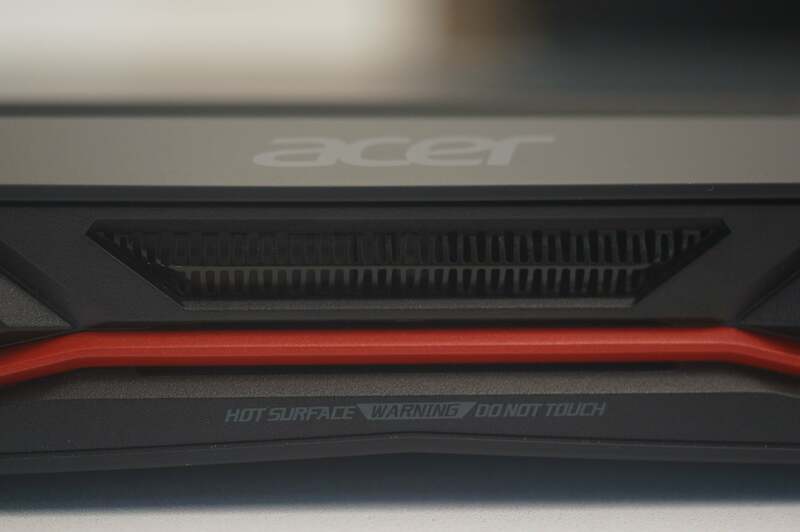 Acer notes in its marketing materials that the chassis design was inspired by “intergalactic battlecruisers,” and it shows, especially in the aggressive-looking grilles with red accents. I personally think Acer has achieved a very nice design balance: There are enough cues to let you know it’s a gaming system, but it’s not so over-the-top that it looks ridiculous. The keyboard on the new Acer Predator 15 is simply superb. All gaming notebooks are built from the same hardware buffet, just mixed and matched according to their price point. The Predator 15 sports a quad-core Intel Skylake Core i7-6700HQ with Hyper-Threading, which runs at 2.6GHz but can boost all the way up to 3.5GHz. The GTX 1060 has 6GB of GDDR5 memory. A laptop this thick could accommodate a GeForce GTX 1070, but one nice side effect of the under-sized GPU is noise. Under heavy graphics loads, the Predator 15's fans are relatively quiet, and the keyboard relatively cool. There are two drives for storage: a 256GB Lite-On SSD for the OS, and a 1TB HGST spinning drive for data and programs. Lite-On is probably a brand most associated with budget optical drives from the turn of the century. These days, it’s a huge player in OEM SSDs. In a performance-oriented laptop, however, it's an awkward fit. It’s a SATA-based M.2 as opposed to PCIe, and it has rather sluggish sequential write performance, hitting just 308MBps in CrystalDiskMark. Consolation prize: It's easily accessible for upgrades. The 16GB of DDR4/2400 memory, on the other hand, is pre-installed and you can’t access it easily. However, there are two empty RAM slots underneath an easily removable access panel. You can add RAM to the Predator 15, and access the M.2 SSD and the HDD. Rounding out the hardware configuration is a 15.6-inch IPS panel that supports G-Sync. It has a matte finish, which is appreciated. Look a bit closer and you'll notice its 60Hz refresh rate. Laptops have dwelt at 75Hz for some time, with some recent panels hitting 120Hz. On desktops, it’s common to see 144MHz and higher. Numerically, 60Hz looks low, but it's competent, especially with G-sync, which will be pretty awesome to have once your GPU starts to get beyond its prime. Internet connectivity is provided by Killer DoubleShot Pro, which offers a wired connection or dual-band 2x2 MU-MIMO wireless 80211.AC. The webcam offers 1280x720 resolution, and the whole package includes a two-year warranty and access to a dedicated support line just for Predator products. What do the Acer Predator 15 and McDonald's Apple Pie have in common? A warning not to touch the inside, because it might be hot. Seriously, this laptop has this warning on the back of it. The closest systems to the Predator are the recently revamped Alienware 13 and the MSI GS63VR Stealth. Both systems are about $400 more expensive than the Predator 15, but have the exact same CPU and GPU, so performance should be similar. This synthetic test has proven its worth by scaling very closely with real-world performance. All three of the GTX 1060 systems we’ve tested recently scored essentially the same. For example, the difference in performance between the Predator 15 and the MSI Stealth is just 0.5 percent, and the Alienware 13 was less than one percent slower overall. 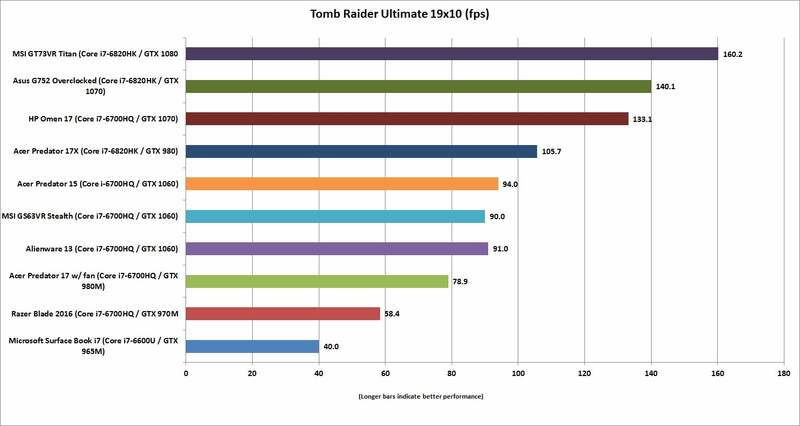 This is the older title (we test with the newer Rise of the Tomb Raider below), but a lot of people play older games, so it’s useful to see how the latest hardware tackles DirectX 11 titles. We run this test at 1920x1080 resolution using the Ultimate preset, which is every setting at its absolute maximum. The three GTX 1060 systems scored between 91 and 94 fps, extremely close to one another and extremely capable of running older games at insanely high frame rates. For the most part, the GeForce GTX 1060 laptops are a tie in performance. We run this game with the HD content pack installed, which includes 4K textures. It’s one of the few titles that can actually consume every ounce of video memory, especially when running at higher resolutions. Because this is a 1080p laptop, our options for punishment are limited, so we just ran it at native res with everything maxed. Not surprisingly there was little deviation between the GTX 1060-based laptops we’ve tested, as they were all hovering around the high 80s to low 90s in average frames per second. The Predator 15 achieved 86.3 fps, while the Alienware 13, for example, hit 87.3. The GeForce GTX 1060 is dead even with the older premium GeForce GTX 980M GPU. Rise of the Tomb Raider is a demanding game and a good representation of the latest bells and whistles available. All of the GTX 1060 systems soared right up to the glorious 60fps marker. The Predator 15 hit 61.2 fps, and the other systems finished a frame or two behind. 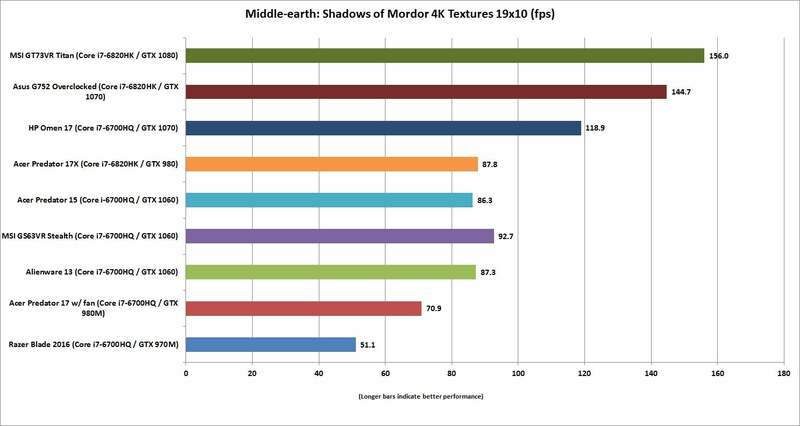 They were all capable of buttery frame rates with everything set to “Very High” and FXAA enabled. One gem revealed by this game is the performance of the “obsolete” GeForce GTX 980M. Inside of the older Acer Predator 17, it was hanging with the newer GTX 1060 card on most tests. 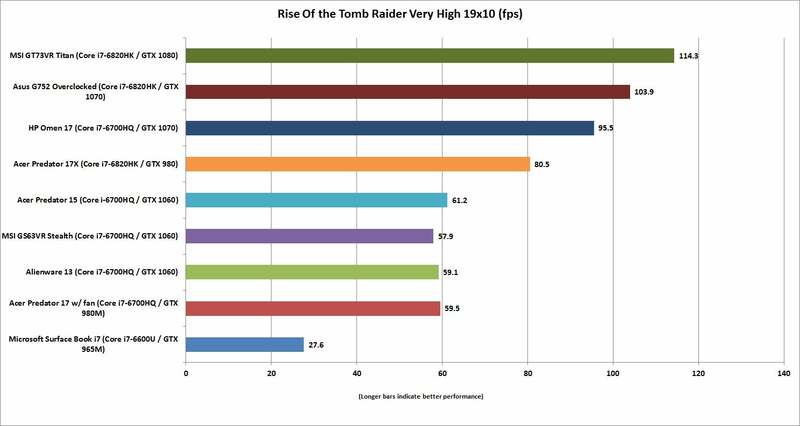 In Rise of the Tomb Raider it actually opens a nice lead, proving that the older “Maxwell” chips still have some legs left. The GeForce GTX 1060 loses handily to the older GeForce GTX 980. For our CPU test we take a 30GB MKV file, toss it into the CPU’s maw, and let it chew until it comes out the other end as an Android-friendly MP4 file. For a very fast quad-core CPU this will take less than an hour, and this test scales very well as more CPU cores and higher clock speeds are added. The Predator 15 needed 53 minutes to complete the test, just a bit behind the Alienware 13 (basically a tie). The MSI Stealth was a smidge quicker at just around 51 minutes, but that’s no basis for grandiose claims. 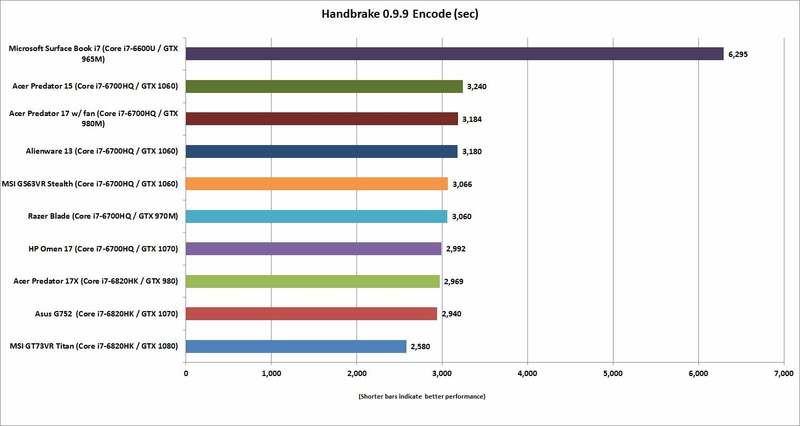 For the most part, the quad-core CPUs are pretty similar in performance. Only the dual-core Surface Book i7, which we include for context, is slower. The MSI GT73VR you see was overclocked for its score. 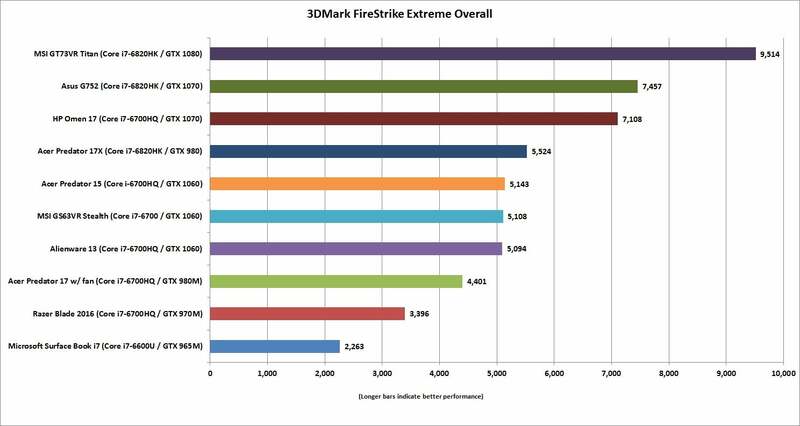 You’re seeing almost no performance delta between the quad-core Skylake chips, save for the overclocked MSI Titan laptop. We understand that battery life isn’t the highest priority for a gaming laptop, as it’ll be plugged in for most of its existence. Because these behemoths typically rock XXL batteries, they can typically run long enough to watch a movie or two. To test battery life we simply loop a 4K video with the laptop in airplane mode, which is mildly strenuous and a reasonable indicator of runtime if you actually were playing a movie on a flight. The Predator 15 lasted for four hours and one minute. We could say that's average for a high-powered gaming machine and leave it at that, but there's more to this result. With that much heft the Predator should surely outlast an skinny little thing like the Stealth, but that MSI competitor ran just three minutes less in our rundown test. The Predator’s also not as long-lasting as a semi-gaming machine like the XPS 15. For a blinged-out rig with a lot of horsepower, the Predator’s battery life could be better. 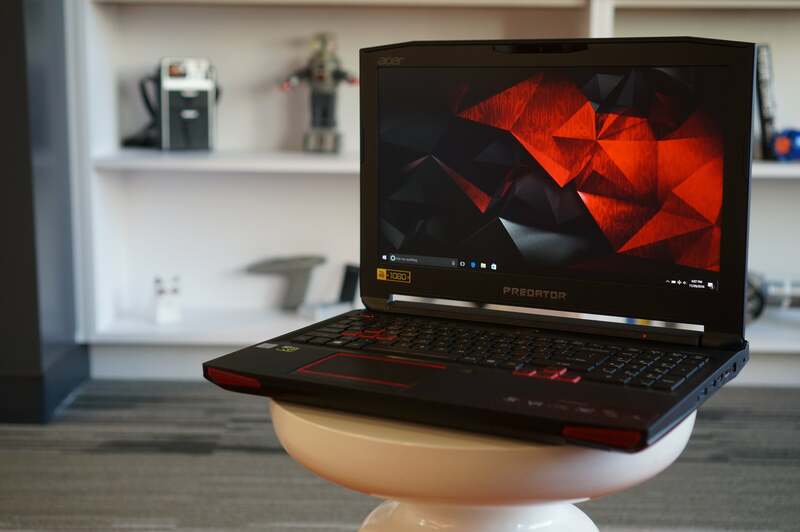 Just how big is the Acer Predator 15? Here's MSI's GS63VR Stealth next to it, which packs the same Core i7-6700HQ and GeForce GTX 1060. 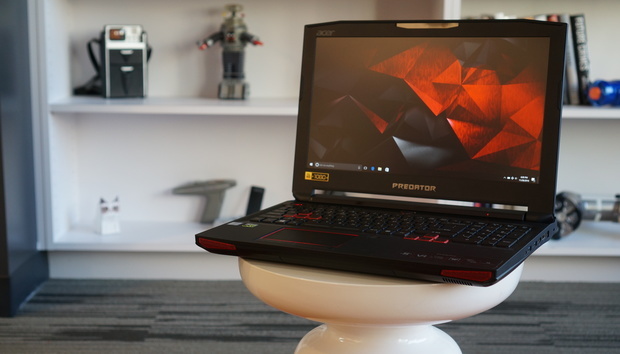 The Acer Predator 15 is brutally big for a 15-inch laptop, but at least it's fast and quiet.